Following the story of the major arcana, looking at differences in the original Rider-Waite (RW) tarot versus the Angel tarot we come next to 4-The Emperor. Where The Empress was soft and emotional, The Emperor is strong and detached. In the Rider-Waite (RW) tarot, The Emperor is seated on a throne, a position of royalty and power. The Empress advised you to take action, but The Emperor insists you do so with a plan. The Emperor card represents constructs of society, structure, stability, and leading with integrity. The card can also represent a father figure, authority, military or government positions. The Empress has us fired up and ready to begin, but it is The Emperor who will help us with a plan of action–a way to make our dreams turn into reality. As a father figure, The Emperor is also concerned about those around us. He does not engage in a leadership position merely to satisfy the Ego. 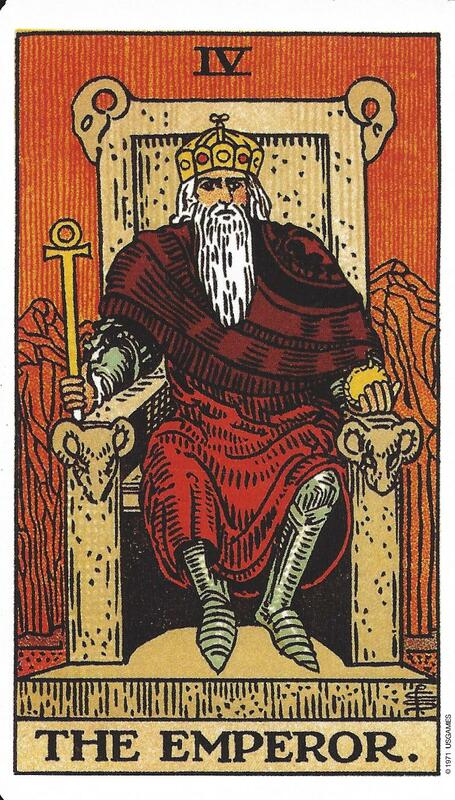 In the RW tarot, The Emperor is seated inside a building (structure) and on a throne with ram’s heads positioned at the end of the arms of the throne and on either side of the back of the throne. Ram’s heads are symbolic of determination, power, courage, and valor. In both the RW tarot and the Angel tarot The Emperor is holding a golden scepter. Gold is the metal of royalty. In the Angel Tarot, there is also a sword positioned against the knee of The Emperor. Swords represent justice. In this case, The Emperor, Archangel Michael, is not yielding the sword but it is close at hand should it be needed. The Emperor is card number 4. Four is associated with angels and stands for stability, structure, and getting things done. Archangel Michael is The Emperor and his name means “he who is like God.” Like God, Archangel Michael is strong and protective. We can feel safe as we plan out our strategy for making our dreams come true. If The Emperor card is drawn in a reading it means it is time to make long-range plans. The querent may be considering leadership positions within his or her occupation. As mentioned earlier some of the occupations associated with The Emperor card include government, military, and positions of authority. Teaching is also an occupation associated with The Emperor because there is a lot of planning in education and long-range goals.